Listen to the ABC’s Steve Austin interview QTIC’s Daniel Gschwind here. There are some 2,500 journalists and 7,000 delegates heading to Brisbane this week for the G20 Leaders’ Summit. Some shops have already shut up shop because of the meeting of global leaders. So how is Queensland’s tourism industry using the event to showcase our city? 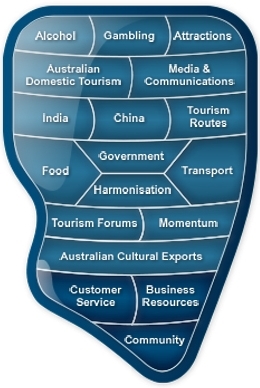 Steve spoke to CEO of the Queensland Tourism Industry Council Daniel Gschwind about their plan for the G20. With 2500 journalists from around the world and 7000 political delegates in attendance, the G20 group of meetings to be held in Brisbane, Queensland, Australia between 12 and 16th November 2014 is second only in size and global media attention to the Olympics. Queensland’s Tourism Industry Council chief executive officer, Daniel Gschwind, said that the 7000 political delegates between them have literally hundreds of millions of followers on social media, so the best thing that tourism authorities can do is ensure the delegates stays in Queensland are as good as they can be. Similarly, 2500 international journalists will be attending the event. Gschwind has described a well-resourced tourism section of the International Media Centre that will supply volumes of tourism content for journalists looking to supplement the high-level political content with more palatable ‘human’ stories. The International Media Centre will be outputting footage, imagery and stories about Queensland, and gathers resources from Brisbane Marketing, Tourism & Events Queensland, Trade & Investment Queensland, and the (QLD) Premier’s Department. A poster (incl. billboard) campaign (pictured) entitled “Brisbane: The New World City” has been on international billboards prior to the G20 as part of the larger marketing of Brisbane as a city worthy of significant international events. The poster campaign however, features the world leaders, but nothing that communicates an unique selling proposition for the city. Steve Austin queried Daniel Gschwind on how the tourism industry and the general public would know the campaign, and the marketing efforts and costs attached to the G20, had been worth the effort. Gschwind responded that the true measure will be in increased significant global events being hosted by the city over the next few years. Austin, an ABC Local host in Brisbane, said that there’s a fear that the city will be empty on the pivotal weekend – the 15-16th Nov. Some shop owners have told Austin that they’d planned long ago to close up shop on the Thursday night. Gschwind remains positive that Brisbane will put on the lively show it does other weekends for it’s G20 guests. Unfortunately, not even the members of the G20 can control the weather.